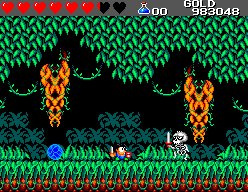 Get ready for the final Wonder Boy adventure on Sega Master System! 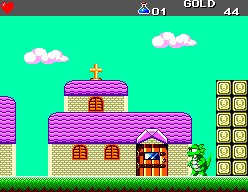 Picking up where Wonder Boy in Monster Land left off, our hero is making his way through a castle to defeat the mighty Mecha Dragon. 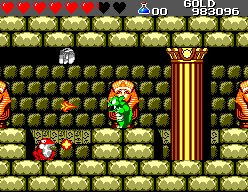 But beware - when Wonder Boy defeats a Dragon, a curse forces him to take the shape of a were-animal, such as a Lizard-Man or Hawk-Man! 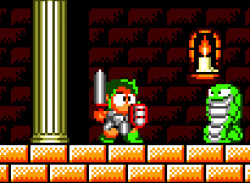 Wonder Boy must travel throughout Monster Land in search of the Salamander Cross, which has the power to remove curses. But where is it hidden - and what form will you take next? Can you beat all of the Dragon bosses and lift the curse? Before reading the overview I had a feeling that this game was related to Dragon's Curse. 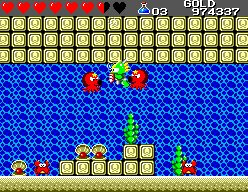 Now this and Wonder Boy in Monster World are the only SMS Wonder Boy titles left to be released. 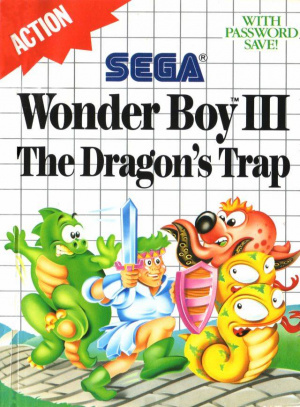 Also, I'm happy this is the last Wonder boy title. Time for SEGA to move on to bigger and better releases. 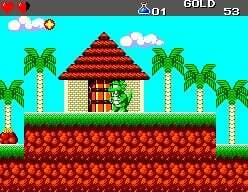 No, the Master System version of Wonder Boy in Monster World is not out. We'll probably see it eventually. 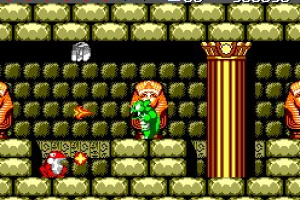 Three Wonder Boy Games were released in the Arcades. 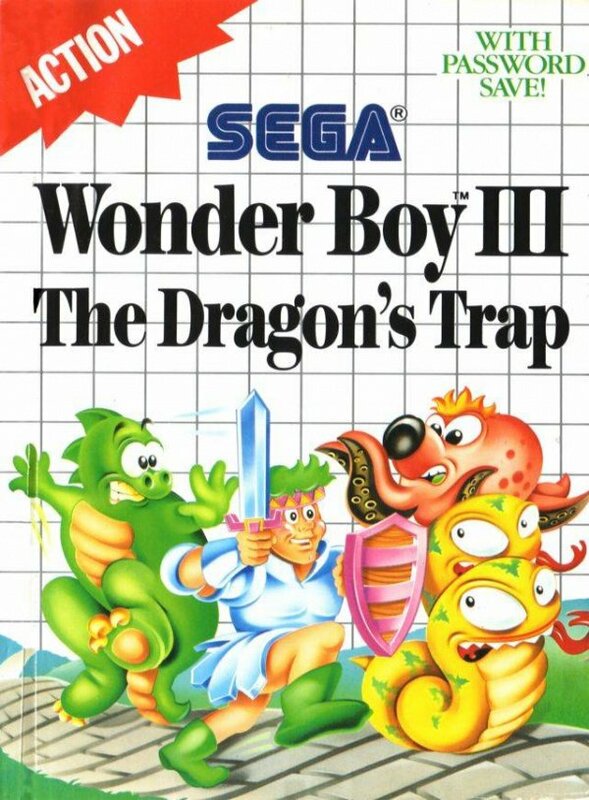 One of the few Sega Master System games I'm intrested in, I actually want to play this game. I heard it got good reviews. @KnucklesSonic8: I agree. Sonic & Knuckles anyone? Ugh I just know this is the VC game NA will be stuck with this Monday. 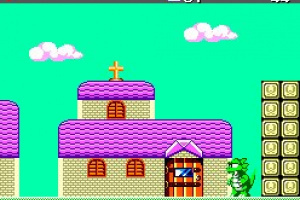 Well I was wrong, although I would've preferred this one over Altered Beast. This is the exact same game as Dragon's Curse, right? 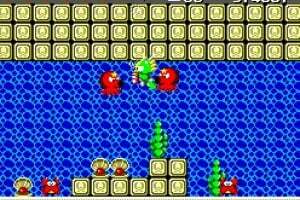 I have this game, on my Wii VC, ... only it's called Dragon's Curse. I still need to get into the game more. I find it decent though. This game does have FM support (Mega Drive quality music basically) but who ever produced the channel has not noticed it only works if the country of the emulator is set to "Japan" [why the original rom was set up like that I don't know since the other FM support roms don't have that error]. The only minor change by doing this is the title is "Monster World II" but the text itself is still in English. The channel itself however is set to so you can activate between PSG or FM When the minus button is pressed] and the manual states it as well, just changing it does bugger all as the emulators country is set to "Europe", so the original PSG music still plays, even is FM is selected. They should have just disabled the Select Menu but to be fair, at least they were trying to give us FM support for that game and I only know about it because someone mentioned it on a forum. I might send a e-mail to Nintendo letting them know about this problem, but I doubt they will listen. About time this game came out in Europe. Looks like America will be stuck with this one on Monday (probably). There are still some ports that can be released on VC. 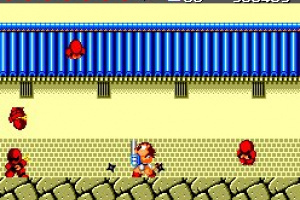 The first three games were also released in the arcade. 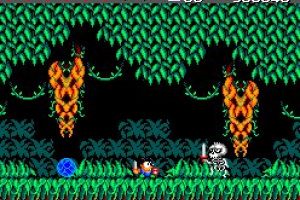 The first game also had another arcade remake! 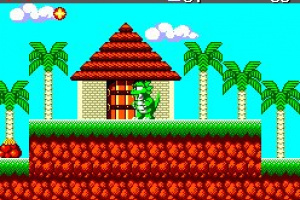 And there was a Master System port of the fifth game. And technically we could also receive the two C64-ports. And if that's not enough, there was an exclusive sixth part only available in Japan. It was released on the Japanese Virtual Console long ago and we could get it in a future Hanabi festival. Now that it's clear here are the re-painted versions, that are all available on the VC! 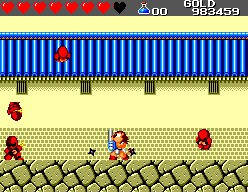 Only the second Wonder Boy wasn't repainted, (at least not in EU and NA). Does the increasing price of the hospital become that much of a problem in this game? Otherwise I might get this version of the game. What a great game, I loved this. Psst... type the password 'WE5T ONE' for access to all characters and full life. Great for a mess around. Siblings had the original- very fun game. Excited about the remake.